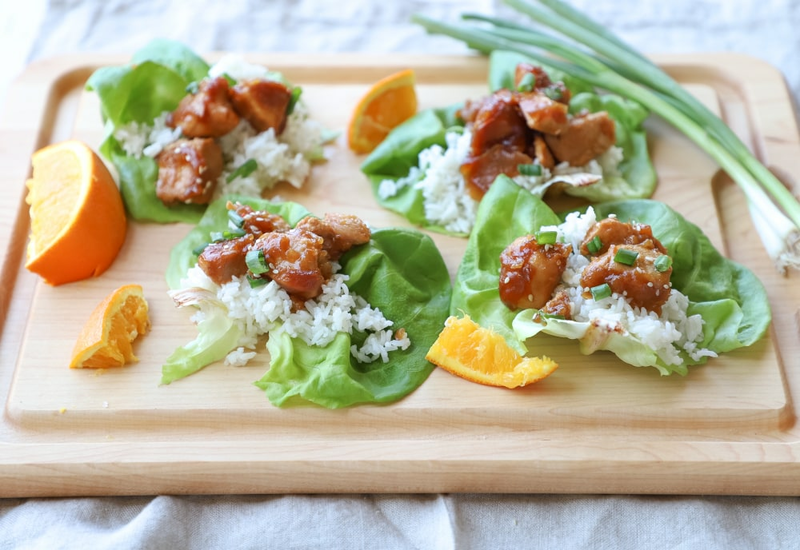 This pressure cooker recipe unites two classic restaurant dishes: orange chicken and lettuce wraps. This combination cooks chicken breast chunks in a tangy orange sauce to be piled with rice into lettuce leaves. The result is a delicious and fun item the whole family will enjoy. Working in batches, sear chicken in hot oil until completely browned, about 5 minutes. Remove browned chicken with a slotted spoon to a bowl. Stir orange juice, water, soy sauce, honey, vinegar, and chili-garlic sauce together in the pot; add chicken and stir to coat. Lock pressure cooker lid in place and set steam vent handle to Sealing. Select Pressure Cook (Manual) and cook for 7 minutes on High pressure. Let pressure release naturally for 10 minutes, then set steam vent handle to Venting to quick-release remaining pressure. Remove ¼ cup liquid from the pot to a bowl; add cornstarch and whisk to dissolve. Stir cornstarch mixture with the mixture in the pot. Select Sauté on the pressure cooker. Cook mixture, stirring frequently, until the sauce thickens, about 5 minutes; season with salt and pepper. 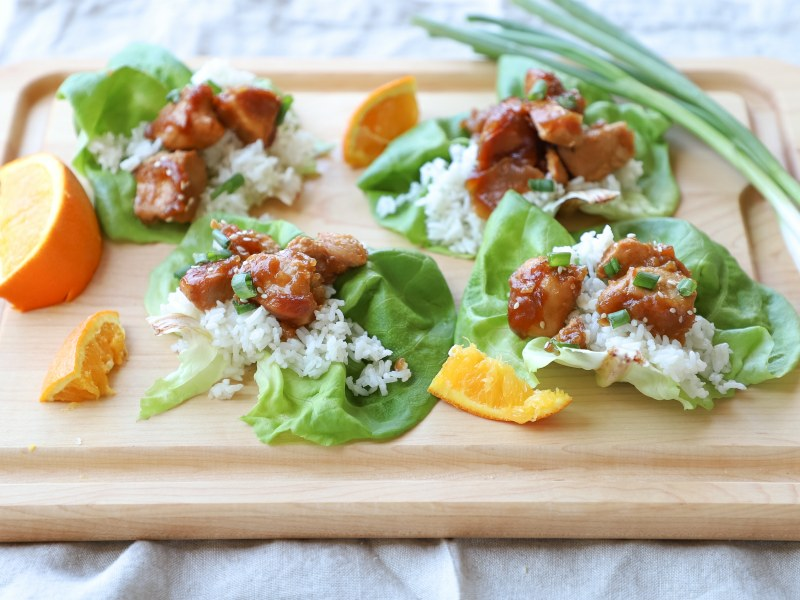 Spoon rice into lettuce leaves; top with orange chicken and garnish with green onion and sesame seeds to serve. Bibb lettuce is sometimes labeled as either "butter" or "Boston" lettuce. Try a few dots of sesame oil on your wrap filling for a great flavor boost. Per Serving: 472 calories; 14g fat; 33.2g carbohydrates; 51g protein; 128mg cholesterol; 927mg sodium. This is a GREAT orange sauce! We didn't use the rice, to be honest. Just the chicken in sauce right into the lettuce cups. My boys love that they're making "tacos" out of the lettuce leaves. What can you do? They liked the chicken, too, because it was a little sweet, but it's not too sweet at all. Worked perfectly in that regard. Good flavor and easy to make. I will add ted peppers or some other veggies next time. The chicken was a bit chewy but my 8 year old ate it all. The orange chicken was definitely the star in this dish. Incredible sauce! I added sesame oil on my wraps, so delicious. The longer you stir the sauce the more it thickens, so don’t be tempted to add more cornstarch. I used romaine lettuce because that’s what I had on hand. Wouldn’t matter either way because the orange chicken sauce is amazing. You can pair it with or without rice, but I think with rice was better. I used brown rice. My husband and I have been trying to cut down on our carbs but still eat foods that taste good. This deal covers all the bases. We used brown rice instead of white rice and also added some orange zest to it for more flavor. This was a hit with my family last night! I added probably about ½ teaspoon grated fresh ginger and the zest of 1 small orange to the sauce before cooking and it was delicious. This recipe is amazing and will be a staple in my house for awhile. I love how they don’t add a bunch of sugar to make it sweet but, instead rely on the honey and orange juice to add that element. My cooking tip is when you sauté the chicken be sure to undercook at about a medium. When you pressure cook it will finish cooking the chicken all the way through. This will prevent your chicken from becoming over cooked and rubbery. I didn’t do the lettuce wrap I just poured it over a bed of stick brown rice. Super easy to make. Next time I’ll meal prep the chicken to make it go faster. I wish I knew how much liquid there’s supposed to be as mIne turned out soupy but the sauce was thick enough to coat the chicken. I’m not one for anything sweet but would like it to have a smidge more sweet. I liked someone’s idea of adding orange zest at the end. I made this with cauliflower rice and it paired perfectly together.